When I first saw the DeWalt ToughtSystem I knew right away that it was something that I wanted to try out on the job. 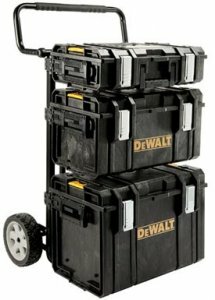 I had already been looking for a better way to store and transport my tools on the job, and a modular system was high on the list. The thing that really hooked me on the ToughSystem was the way the boxes attach to the L-Cart Carrier, and that they can each be removed individuality. There was one problem with the boxes though, they were hard to find. Amazon was one of the few places that had them and once they sold out of their initial stock, it took months for them to get more in. Even after Amazon got more in stock, they didn't have the largest box, or the L-Cart Carrier. But the good news today is that Amazon has all three boxes in stock, as well as the L-Cart. If you are interested, you will have to hurry though, Amazon has low stock on XL box and the L-Cart. You can also purchase from ACME Tools through Amazon, but you will have to pay for shipping. If you are not in a hurry, you might want to wait for my review of the complete set.